Flowers and greenery are a staple in the farmhouse trend! 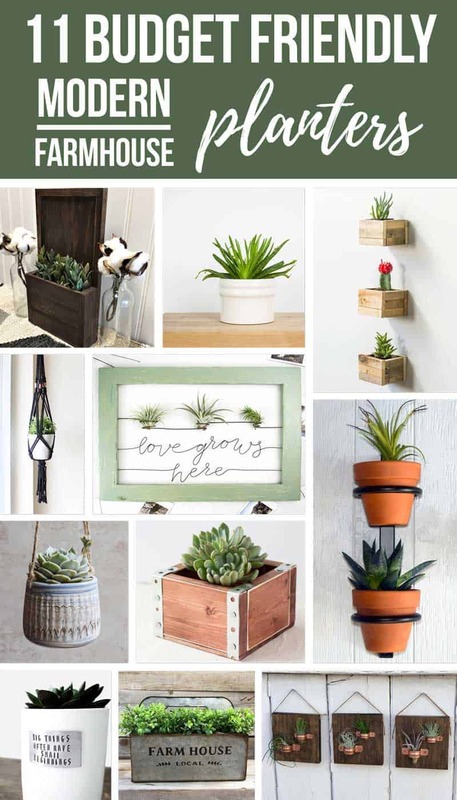 If you’re looking for a fun way to add modern farmhouse style to your home decor, grab one of these budget friendly farmhouse planters! Ever since we moved into our new fixer upper, I’ve thinking about decor plans. Even though decorating seems like it is so far away from here with all the renovating and unpacking we need to do, it’s fun to dream. I’ve even started thinking about our little girl’s nursery…eek! As I think about our home decor plans, I’ve been wanting to infuse more modern into our farmhouse. I love the cleaner look of the modern farmhouse decor style. Spring is literally just around the corner and that means it is time to bust out all of the flowers and greenery for your home. Since I’ve got modern farmhouse style on the mind, here’s 11 modern farmhouse planters. And, of course, these are all budget friendly planters that you can grab for less than $50 from Etsy. You’re going to to love them! This farmhouse planters post contains affiliate links, but nothing that I wouldn’t wholeheartedly recommend anyway! Read my full disclosure here. Are you ready to see these 11 modern farmhouse planters under $50?! This wooden planter goes on the wall and is simply adorable! It comes with faux greenery already in it. It would look so cute worked into a gallery wall. This adorable white modern plant pot could hold a succulent, cactus, or houseplant. This stoneware ceramic planter was hand-crafted on the pottery wheel and dipped in milky white glaze. Since this planter doesn’t have a drain in the bottom, it is recommended for a dryer plant like a cactus or succulent (or even something faux…which is SO my kinda plant!). These floating planters definitely fit right in with the modern farmhouse style. 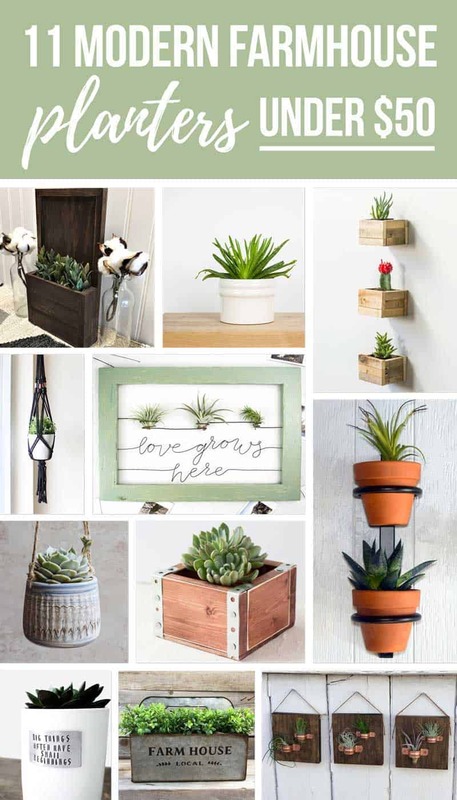 The planters, which are made from pallet wood (and you guys KNOW how I love me some pallets) are a stylish and creative way to display your favorite succulents and bring life to any room. (UPDATE: The ones show in the photo are no longer available, so I’ve linked to something very similar). I love the boho look of macrame! Do you see that little touch of copper hiding in there too?! These are perfect hanging in the corner of a room to really add a lot of character. This plant hanger could also be used outdoors on a porch or deck. I am IN LOVE with this metal quote air planter. I love how unique it is! I’ve never seen anything else like it. Love the saying “love grows here”. She has so many other cute modern farmhouse designs in her shop too. These modern farmhouse planters look like something you’d find on Fixer Upper. The rings have a 3.5in interior diameter and are shown here with 4″ terracotta pots. They also have other fun metal wall planters with modern farmhouse style available in their store. I love hanging planters! This handmade ceramic hanging planter has a drainage hole and is made of porcelain and stoneware. Love the white-tan swirl pattern in the clay. This would look so cute hanging in a window with a little succulent, don’t you think? (UPDATE: The blue one shown in the picture is no longer available, so I’ve linked to a very similar one in a tan color). Isn’t this little wooden flower boxes cute? I love the metal edging to add an industrial & modern element. If you didn’t want to put plants in it, you could even use it to hold silverware, utensils, or a candle! This little white ceramic planter is so cute! It comes with a cute message on it saying “love grows here”. These definitely have a modern farmhouse feel to it. It does have a drainage hole, which make them great for succulents, cactus, or other plants. I love that they come in a number of different sizes too! Galvanized metal is a staple in the farmhouse decor style, so I had to include a little bit of galvanized in this list of modern farmhouse planters. This would look so cute on a coffee table or even as a centerpiece at your dining room table! I love these hanging wooden plaques to hold air plants. The copper holders are such a fun touch and copper is REALLY “in” right now! I haven’t jumped on the air plant bandwagon yet, but supposedly they are really easy to care for, which is just what I need! (UPDATE: The ones shown in the photos are no longer available, but I’ve linked to something very similar). Don’t these modern farmhouse planters get you in the mood for Spring?! I don’t know about you, but I can’t wait! I’m definitely looking forward to adding in some flowers and plants around our home this Spring and some of these planters just may end up at my house! Which of these modern farmhouse planters is your favorite?? I’m big on galvanized metal so that’s my choice!